(ZIZ)– St.Kitts Nevis has assumed chairmanship of the Organization of American States Permanent Council. 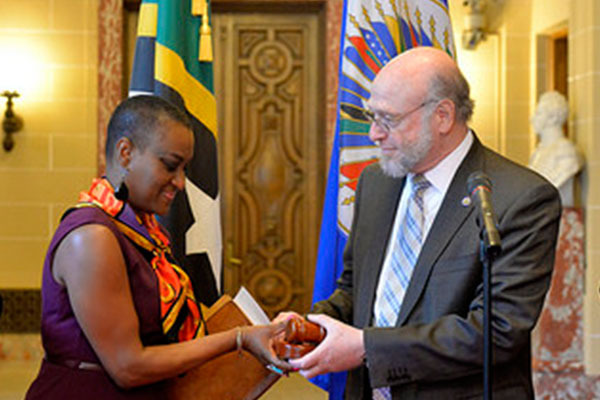 The permanent representative of the Dominican Republic to the OAS, Pedro Vergés, transferred the mantle of chairmanship to Her Excellency, Jacinth Henry-Martin of the Federation Of St. Kitts & Nevis on Wednesday. Ambassador Henry Martin stated her resolve to effectively preside over an essential body of one of the oldest and most influential multilateral organizations in the hemisphere. “On this occasion I’d like to take the opportunity to recommit our support and the present and active participation of St.Kitts and Nevis to upholding all of the values of this hemispheric organization,” he said. Secretary General Jose Miguel Insulza, Assistant Secretary General Albert Ramdin and the delegations of the member states attended the ceremony. The permanent council is a political platform in which the member states seek to maintain friendly and diplomatic relations while they engage in meaningful dialogue and cooperation to address pressing issues facing the region.